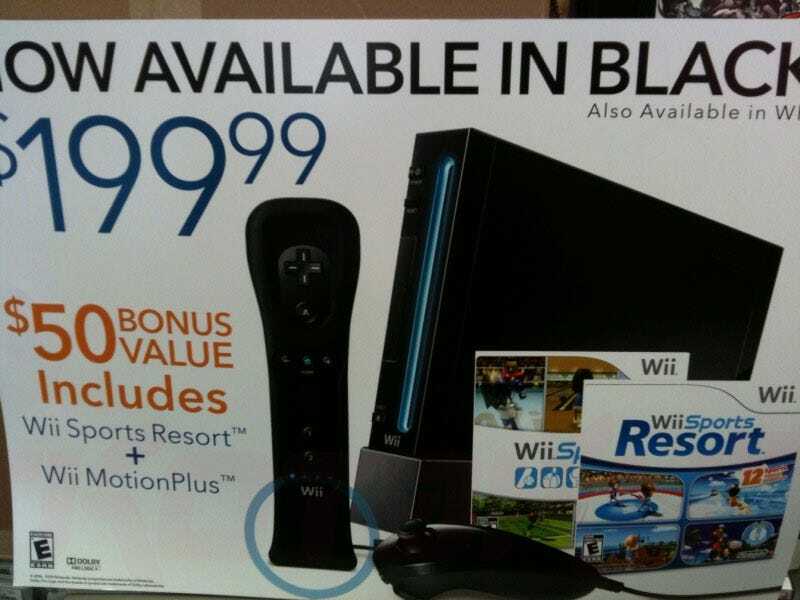 While you were probably happy seeing proof of the imminent arrival of the black Wii on American shores, retailer GameStop is less so, sending a lengthy email to its stores earlier today in the wake of the console's "leak". As you know, there is a lot of rumor and speculation about various new products and titles launching this year. One of these is the Black Wii. Various blogs and internet sites are raising awareness about this product. Gamestop stores and associates should not proliferate these rumors. Today, you received POP for your windows regarding the Black Wii. Somehow, a picture of this appeared on the internet. It may seem cool to be in the know and feel compelled to share something like this. Nothing can be further from the truth. All activity like this does is hurt our reputation with publishers and manufacturers and potentially hurts our company. Until Nintendo decides to announce THEIR product, there should be no discussion of it with customers, period. If they ask, "It's not appropriate to comment on speculation and rumor" should be the answer. The POP should be secured in the back room and left there until further notice. ANY violation of these will be treated with the most aggressive consequences. I believe strongly in the field organization, but I am as disappointed as I have been in my tenure here in how we are handling this. I am trusting that your professionalism will result in no further issues. According to our sources, it seems the motivation for the email was a threat from Nintendo to pull all its products from GameStop stores, in retaliation for the succession of leaks leading up to today's photo. A hollow threat it may have been, with GameStop surely being too big a customer to actually freeze out, but it's a threat nonetheless. I love this guy. He sounds like he's 84 years old. Somehow? One of your employees took the photo and sent it to us. Not cool? I'd say something that prompts an email in which the rallying cry for downtrodden retail employees is the preservation of one wealthy corporation's reputation with another wealthy corporation is very cool. And the final punchline in this, surely the most ineffective corporate email of all time? Aside from the fact the email confirms the impending release of the console, one that's not even that big a deal, since it's been out in other countries for months? That he honestly believes GameStop employees - or customers on the listening end - will be able to make it all the way through "It's not appropriate to comment on speculation and rumor" with a straight face. It's understandable that GameStop HQ doesn't enjoy leaks like this, especially in light of such reportedly drastic threats. But when you place frontline retail employees in charge of what are essentially "trade secrets", what do you expect?